Probably one of the most annoying aspects of planning a wedding is the dreaded seating chart for the reception. 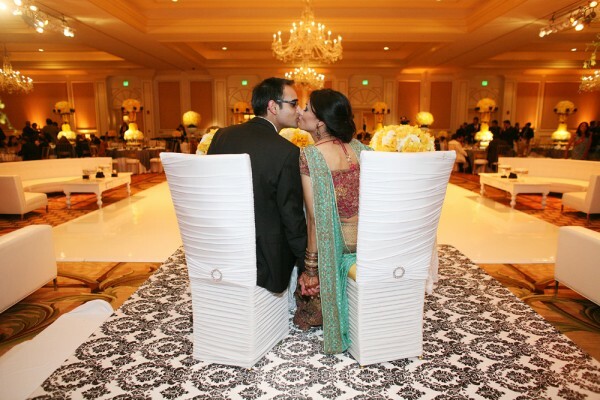 While most of planning a wedding is exciting and fun, most find the job of seating tedious and frustrating. While we are certainly sympathetic to your plight and you may have severe constraints at your venue, here is some advice on where to place your DJ when figuring out seating. The optimum location for your DJ is in the center of the room (with their back to the wall–not literally in the center), next to the dance floor. Place your guests to left and right of the dance floor / DJ setup. This is critical for a number of reasons. The closer your DJ is to “the action” on the floor, the easier it is to feel the vibe of the crowd. Requests are easier and idle chatter can be heard to help direct the DJ to desired genres of music. In addition, this setup allows you to place your older guests furthest from the speakers. Although the DJ should never play too loud (one of my pet peeves as a DJ), once the party gets started the older folks are sufficiently away from the music so that they can reminisce. The center setup also allows for dance floor lighting to be placed around the DJ setup, right onto the dance floor. Try to avoid placing your DJ in a corner, forcing them to send sound over people onto the dance floor in the center of the room. This is simply not an efficient way to maximize sound. The people in front of the speakers suffer, while the people in the opposite corner struggle to hear. This also adversely affects any lighting to be effective. Please avoid this whenever possible. Finally, make sure your DJ is given enough space to operate. While most reputable DJs do not use crates of cds or albums, your DJ still needs space to move. Before I had the experience and the maturity to ask, I was sometimes pushed into a tiny corner, adversely affecting my ability. Once again, we are sympathetic to your venue’s restrictions and family issues. Whenever possible, we recommend these simple rules for maximum dancing and having a festive atmosphere!